Six inch oil diffusion pump. Diffusion pumps use a high speed jet of vapor to direct gas molecules in the pump throat down into the bottom of the pump and out the exhaust. 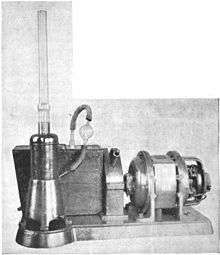 Invented in 1915 by Wolfgang Gaede using mercury vapor, and improved by Irving Langmuir and W. Crawford, they were the first type of high vacuum pumps operating in the regime of free molecular flow, where the movement of the gas molecules can be better understood as diffusion than by conventional fluid dynamics. Gaede used the name diffusion pump since his design was based on the finding that gas cannot diffuse against the vapor stream, but will be carried with it to the exhaust. However, the principle of operation might be more precisely described as gas-jet pump, since diffusion plays a role also in other high vacuum pumps. In modern text books, the diffusion pump is categorized as a momentum transfer pump. The diffusion pump is widely used in both industrial and research applications. Most modern diffusion pumps use silicone oil or polyphenyl ethers as the working fluid. Cecil Reginald Burch discovered the possibility of using silicone oil in 1928. An oil diffusion pump is used to achieve higher vacuum (lower pressure) than is possible by use of positive displacement pumps alone. Although its use has been mainly associated within the high-vacuum range (down to 10−9 mbar), diffusion pumps today can produce pressures approaching 10−10 mbar when properly used with modern fluids and accessories. The features that make the diffusion pump attractive for high and ultra-high vacuum use are its high pumping speed for all gases and low cost per unit pumping speed when compared with other types of pump used in the same vacuum range. Diffusion pumps cannot discharge directly into the atmosphere, so a mechanical forepump is typically used to maintain an outlet pressure around 0.1 mbar. Diffusion pumps used on the Calutron mass spectrometers during the Manhattan Project. The oil diffusion pump is operated with an oil of low vapor pressure. The high speed jet is generated by boiling the fluid and directing the vapor through a jet assembly. Note that the oil is gaseous when entering the nozzles. Within the nozzles, the flow changes from laminar, to supersonic and molecular. Often, several jets are used in series to enhance the pumping action. 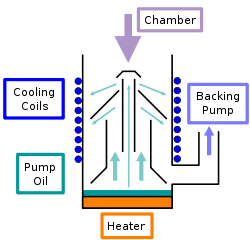 The outside of the diffusion pump is cooled using either air flow or a water line. As the vapor jet hits the outer cooled shell of the diffusion pump, the working fluid condenses and is recovered and directed back to the boiler. The pumped gases continue flowing to the base of the pump at increased pressure, flowing out through the diffusion pump outlet, where they are compressed to ambient pressure by the secondary mechanical forepump and exhausted. Unlike turbomolecular pumps and cryopumps, diffusion pumps have no moving parts and as a result are quite durable and reliable. They can function over pressure ranges of 10−10 to 10−2 mbar. They are driven only by convection and thus have a very low energy efficiency. One major disadvantage of diffusion pumps is the tendency to backstream oil into the vacuum chamber. This oil can contaminate surfaces inside the chamber or upon contact with hot filaments or electrical discharges may result in carbonaceous or siliceous deposits. Due to backstreaming, oil diffusion pumps are not suitable for use with highly sensitive analytical equipment or other applications which require an extremely clean vacuum environment, but mercury diffusion pumps may be in the case of ultra high vacuum chambers used for metal deposition. Often cold traps and baffles are used to minimize backstreaming, although this results in some loss of pumping ability. 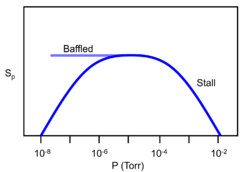 The oil of a diffusion pump cannot be exposed to the atmosphere when hot. If this occurs, the oil will burn and has to be replaced. Plot of pumping speed as a function of pressure for a diffusion pump. Early Langmuir mercury diffusion pump (vertical column) and its backing pump (in background), about 1920. The diffusion pump was widely used in manufacturing vacuum tubes, the key technology which dominated the radio and electronics industry for 50 years. The steam ejector is a popular form of diffusion pump for vacuum distillation and freeze-drying. A jet of steam entrains the vapour that must be removed from the vacuum chamber. Steam ejectors can have single or multiple stages, with and without condensers in between the stages. One class of diffusion vacuum pumps is the multistage compressed-air driven ejector. It is very popular in applications where objects are moved around using suction cups and vacuum lines. ↑ Gaede, W. (1915). "Die Diffusion der Gase durch Quecksilberdampf bei niederen Drucken und die Diffusionsluftpumpe". Annalen der Physik. 46 (3): 357. Bibcode:1915AnP...351..357G. doi:10.1002/andp.19153510304. ↑ D. G. Avery and R. Witty (1947). "Diffusion pumps: a critical discussion of existing theories". Proc. Phys. Soc. 59 (6): 1016–1030. Bibcode:1947PPS....59.1016A. doi:10.1088/0959-5309/59/6/313. ↑ C. R. Burch (1928). "Oils, greases and high vacua". Nature. 122 (3080): 729. Bibcode:1928Natur.122..729B. doi:10.1038/122729c0. Hablanian, M. H. (1994) . Diffusion Pumps : Performance and Operation. AVS Monograph Series (2nd ed.). New York, NY: American Vacuum Society. ISBN 1-56396-384-1.